Latin American economies have been slowing down in the wake of softer commodity prices, especially in Brazil and Argentina, as governments try to repair some past policy mistakes. Against this backdrop, here are some of the issues we think will be important in the region over the year to come. 1. Will we see green shoots in Brazil? Yes. In our view, the economy will grow 1.5% in 2017, albeit mostly due to inventory adjustment. We expect 1Q17 to mark the first quarterly GDP increase since 4Q14. 2. Will we also see recovery in Argentina? Yes – thanks to the Brazilian recovery, healthier real income growth and fiscal expansion. 3. Which country will lead the growth league table in 2017? Peru is, as in 2016, the likely winner of this particular race, with 4.0% estimated expansion (despite lackluster domestic demand), thanks to the strong performance of its mining industry. 4. Which country will lead the low-inflation league table? With a 2.7% increase in its official consumer price index, Peru will. It will be closely followed by Chile (2.8%), as long as the country’s currency remains stable. The worst performers will likely be Argentina (22%), but that will be a marked improvement on 2016 (41%). 5. Will currencies end 2017 stronger than in 2016? No, with the exception of the Mexican peso, which has probably already overshot its post-Trump adjustment. The sharpest depreciation is expected to take place in Argentina, due to the inflation differential and earlier peso appreciation. 6. Will we see monetary policy convergence in the region? With Banxico likely to shadow the Fed, Mexican rates will rise. 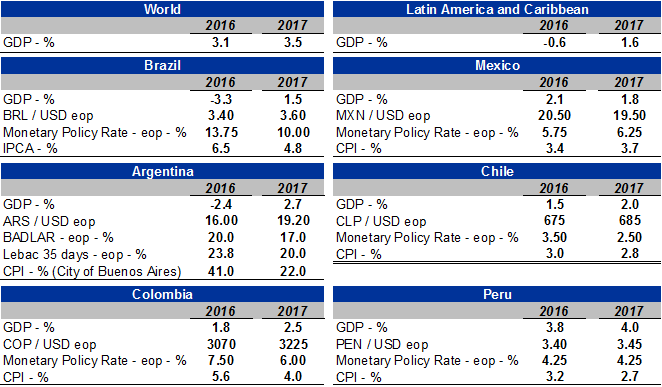 Elsewhere in Latin America, rates will probably drop, albeit at varying speeds, thanks to better anchored expectations, more stable currencies and economic slack. 7. Which political events should be monitored? The fate of social security reform in the Brazilian Congress (1H17), the Argentine mid-term elections (October) and the Chilean presidential elections (November). 8. How will prices of major commodities perform? Despite prospects of a potential US infrastructure investment programme, we expect commodity prices to drop modestly (2% on average) in 2017, led by lower metal prices, with agricultural commodities performing better and relatively stable oil prices. 9. Will weather patterns be favourable or negative in 2017? Neutral, unlike in recent years, but hydroelectric reservoirs in Brazil are still low, creating a potential supply constraint if demand surprises to the upside. 10. What is the main external risk for the region? A risk-off environment triggered by increasing trade and geopolitical tensions between the US and China.